Penske: "Another outstanding performance from our U.K. operations." DETROIT -- Penske Automotive Group Inc. wants to grow by snapping up more car dealerships overseas and buying other businesses, such as heavy-duty retail truck stores. Penske said today it agreed to raise its stake in The Around The Clock Freightliner Group, a “heavy-duty retail truck dealership group” in Texas, Oklahoma and New Mexico. Penske said such businesses are attractive because they provide strong revenue with lower costs. 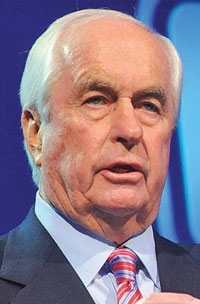 CEO Roger Penske, in an analyst conference call today, said: “When I look at the commercial vehicle business, 70 percent of the total gross profits are from parts and service. So less capital is involved. It’s a more stable business, and there are not the facility requirements, such as the tiled floors and fancy showrooms,” that many automakers require. He said his company is spending $150 million a year largely on car dealership renovations that manufacturers want. Penske said he also is monitoring a no-haggle pricing program being tested at Toyota of Surprise in Surprise, Ariz. He said he is a “long, long way” from deciding whether or not to take the process to all of the company’s 244 U.S. dealerships, but it is successful so far. He said using one salesperson from start to finish is a cost saver. Earlier today, Penske Automotive reported that its third-quarter net income rose 15 percent from the year-earlier period to $75.1 million on strong new- and used-car sales aided by robust business at its U.K. dealerships. Revenue increased 18 percent to $4.42 billion. Revenue rose at a double-digit pace in all categories: new- and used-vehicle sales, fleet and wholesale sales, service and parts, finance and insurance operations and commercial vehicle, car rental and others. Roger Penske envisions 60 percent of Penske Automotive Group’s revenue coming from its U.S. operations and 40 percent coming from various international holdings. That’s close to where it is now. He wants the company’s vehicle business revenues to grow 5 to 10 percent over the next two years. He said the company wants to stay focused on premium luxury brands and will still consider some “opportunities” in the United States, too. “But we want to stay in line as a premium volume foreign player,” Penske said. The company’s third-quarter results were driven by solid sales in its U.K. operations. Those operations account for 35 percent of Penske Automotive’s revenue. The U.S. makes up 61 percent, and other international operations account for 4 percent. The higher revenue came on a 10 percent increase in retail sales to 104,963 vehicles. New-vehicle sales rose 9 percent to 57,273 units, outpacing the U.S. industry’s new-vehicle sales growth of 6 percent in the quarter. Penske’s used-vehicle retail sales rose 12 percent to 47,690. On a same-store basis, though, new-vehicle retail sales lagged the overall market with a 4 percent gain to 54,572. Same-store used-vehicle sales rose 7 percent to 45,678. Penske Automotive doesn’t break out unit sales by geographic region -- all totals reflect U.S. and overseas operations. After-tax income from continuing operations rose 16 percent to $77 million. The company said it agreed to raise its stake in ATCFreightliner Group to 86 percent from 27 percent. The acquisition is expected to add $600 million to $700 million in incremental annual revenue, Penske said. Penske Automotive, of Bloomfield Hills, Mich., near Detroit, ranks No. 2 on the Automotive News list of the top 125 dealership groups based in the United States, with retail sales of 199,795 new vehicles in 2013.